We forget a lot of things. We forget a relative's birthday, we forget to pay a bill, we forget to return a library book. We forget to return that phone call, to switch the load of laundry, to buy eggs at the grocery store. At the end of the day when we fall into bed, we forgot to let the dog out, we forgot to pack a lunch for the next day, we forgot to give the neighbor back their leaf blower. There are certain things we remember. We remember our first kiss, we remember when we landed that coveted job, we remember receiving a new bike on that special Christmas day. We remember how bad that sunburn hurt three summers ago and we remember the taste of Grandma's apple pie. We close our eyes and remember the sight of our firstborn child in our arms moments after birth, the face of our third grade teacher, the soft fur of our favorite pet cat. We try to forget that embarrassing thing we said at work. We wish we could forget the angry disagreement we had with our mom. We really want to remember the recipe for that awesome dessert, and we pretend to remember the name of the person we were introduced to last Sunday at church. God gave us something this past week. Besides the obvious gift of a successful open heart surgery and restored health for our daughter Chloe, God gave us His presence. We felt Him when we released our daughter for surgery, when we anxiously sat in the pediatric surgical waiting room, when the nurse practitioner slowly sat down by us and said the valve might have to be replaced, when the surgeon smiled at us and said everything turned out fine after all. We knew God was holding us when we read all the comments and emails from the people praying for Chloe, and the strength of their conviction that God would answer helped us through each hour. 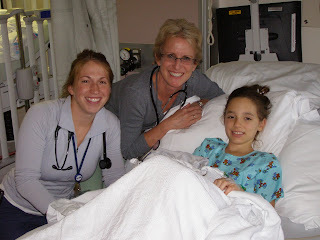 We knew God had Chloe in the palms of His hands when we saw her in the ICU, and she couldn't talk because of the breathing tube down her throat but she painstakingly lifted her hands and tapped her mom's glasses to signal that she wanted her own glasses. We knew God was walking the hospital halls with us when he sent a hurting single mom our way to pray with and comfort even in our time of need, and two days later she glowed with relief and joy as her little boy was healing and recovering. 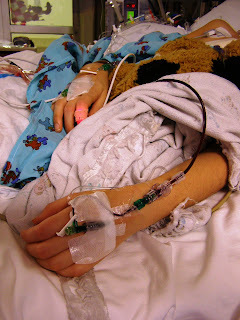 She told us how much better she felt after praying with us because it reminded her God was still with her, even in the hospital, and there would be good to come out of this. We know God is watching over our home now, as our family is back together, and we sit at the table and eat pancakes together and bat around the shiny balloons that tell Chloe to Get Well Soon and yell at the television that shows our favorite football team losing. We know God is pressing His healing hands upon her stitched-together chest as we see her progress more and more each day, walking around the house, climbing in and out of the tub, laughing with her siblings over a silly joke. We don't want to forget a single second of this. We want to remember each tear, each smile, each squeezing fist of fear and each sigh of relief, each nurse's face and each tube that came and went from Chloe's body. Because each one of these tells the story of what God has done and will continue to do through our daughter's life, and this story is for all of us who know Him as "our creator, our life sustainer, Deliverer, our comfort, our joy.....our shelter, our peace in the midst of the storm." **The video isn't working. Here is another one, but without the lyrics. Things are moving right along. This morning Chloe put together her hope beads, ate breakfast, got a chest x-ray, and took a shower. 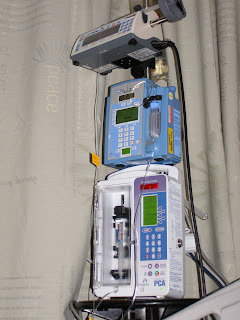 All her IV lines came out and the stickers that were on her tummy that the leads were hooked up to (for monitoring heart rate, oxygen levels, etc.) were all taken off. Her chest x-ray looked very good, and a prescription for pain medication that we will take home with us has been filled at the pharmacy here. 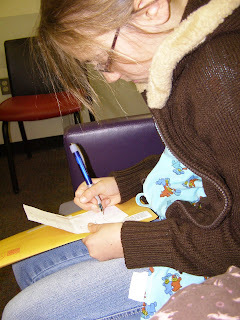 So right now we are waiting for some discharge instructions and, of course, papers to sign. Chloe was very cheerful and alert this morning, but after all the activity, she is tired again. We will update again once we know more details, and hopefully we will be able to add some more pictures then - there is a problem again with the wireless connection. Please keep little Eric in your prayers too - he is the 5 year old who had surgery the same morning as Chloe, and we prayed with his mom in the waiting room. His chest tubes came out yesterday and he might get to go home today, which his mom is very excited about. Thanks! Chloe is so much more herself tonight. It makes her parents happy and relieved! Even though having all her tubes out made her feel better, she still slept a lot this afternoon and did not want to do much of anything. Finally after eating some supper, she perked up, and for a good hour this evening she was smiling and talking with her mom and dad. 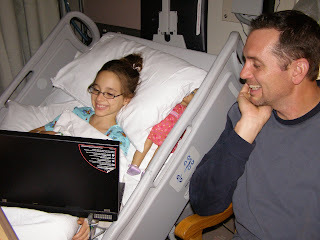 She was interested in hearing all the comments on the blog, and especially liked the ones from her little sister Lydia. We had to read those twice! Chloe even decided she had a few things to say on the blog. She could go home tomorrow! That would be wonderful for all of us. Chloe's sister celebrates a birthday on Saturday, so we could all be home together for that. Plus Chloe would like to be in her own bed. But this whole recovery process has gone so smoothly, we couldn't ask for anything more. 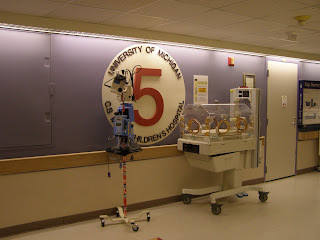 There are children who have to stay here for weeks. 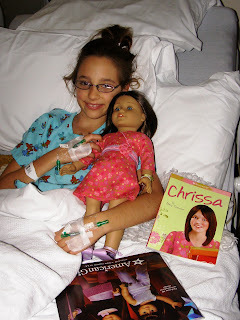 We know Chloe is very fortunate to have the surgery and recovery go so well. She took a long nap after the echo and EKG and woke up long enough to eat some soup and drink some apple juice. That is the first thing she's had to eat since supper Monday night. She had no appetite, even when they told her she could eat. It does help her appetite to be off the IV pain meds and just on oral ones. So this day has been one of good progress, even just since this morning when she was in a decent amount of pain. We'd love to get her walking the halls again later today. But for now, we are so happy just to see her smile! Chloe had a very good night. 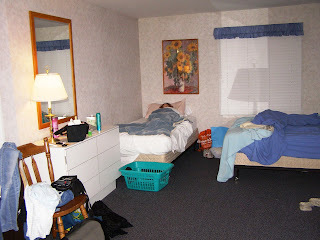 She slept well, getting up once to use the bathroom. She is still getting pain medication and a diuretic to keep her kidneys going. There have been no problems with that. She does seem to be more sore this morning, which is not unusual for the second day after surgery. She is scheduled to get her chest tubes out this morning, which should help lessen the pain. After the tubes come out, she will go for an echo to see how her heart is functioning, and specifically how her newly repaired valve is doing! Please pray for her chest tubes to come out easily and for her pain to be eased after that. They will give her extra meds during the tube removal (and some "sleepy" medication too!) and then they stitch the openings shut. The rest of her lines should come out too, and then all her meds after that will be taken orally. Also, pray that her echo will look good and they will be pleased with what they see. Pray that she will feel like walking around this afternoon and trying some of the fun activities they have here for children. Her spirits are a bit droopy this morning, and she hasn't wanted to do anything, not even read or be read to. It has been another long day but also a good, hopeful one. 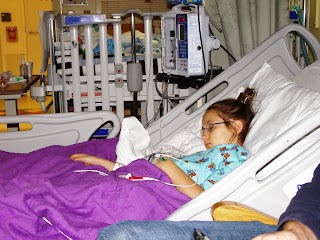 Chloe ended up sleeping quite a bit this afternoon and was complaining of pain. But after a very long nap, she got up out of bed and went for a walk down the hall. This was a wonderful development and something that will help her recovery process. She was tired afterward, but she still asked to do her breathing. She needs to take deep enough breaths to give her lungs a workout. 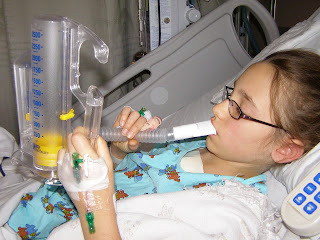 After being on bypass during the surgery and then on a ventilator, she needs to make sure her lungs are in good shape. When she breathes with this pipe in her mouth, a little yellow ball moves up with her breath. She has a target to aim for with the yellow ball so she knows if she is taking good, deep breaths. 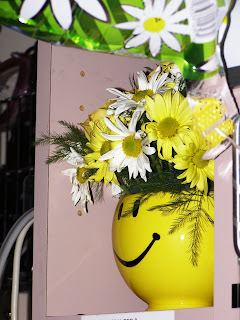 You can imagine it would not feel so wonderful to take a huge breath the day after your chest was just opened up, but she has been working hard at this, probably because she knows it will help her get discharged and head home! 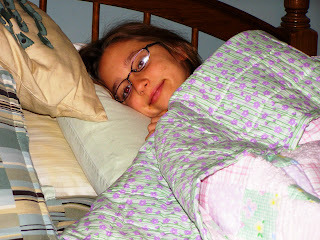 Now she is ready for a good night's sleep with her new purple blanket. We thank you for your continued prayers and loving comments for Chloe. We have felt God's presence with us and know His arms are around Chloe. It's Wednesday at 12:20 p.m. Chloe moved this morning to general care from the ICU. She continues to do well. 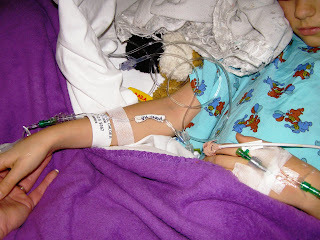 She got several lines removed before she left the ICU, so there are fewer wires and tubes coming and going from her. Her numbers still look good, and she impressed the nurses by walking to the bathroom. Her rash is coming back a little bit on her legs but doesn't seem to bother her. In fact, she is such a good patient, her nurse told the brand new nurse that is helping her not to get used to having patients like this; they are usually more uncooperative! 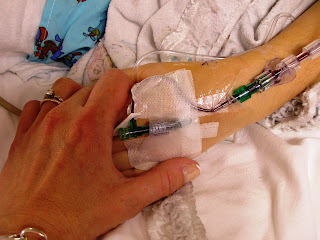 Getting an IV removed before she leaves ICU. Sleeping peacefully in her new location on the general floor. Sometimes we wonder why Chloe has to go through this. We know He has a purpose for her, but when she is suffering it is hard to see the point of it. But just in these past few days, God has already put people in our path whom we have been able to talk to, share stories with, and pray for. When Chloe is ready, we will tell her how God was able to use her during this surgery time to reflect His love, even while she was not awake. God placed a single mom in our path and parents whose daughter is the same age as Chloe and having her second surgery too. We are praying for their children. 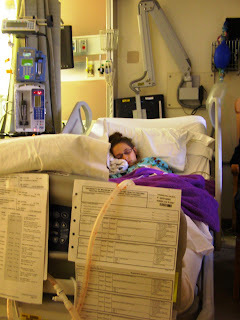 Watching Chloe go through this is giving us strength to do whatever work God has in store for us and Chloe. It is Wednesday morning. Chloe had a very good night. 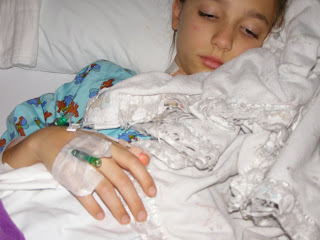 Her rash is gone, she hasn't had arrythmia in hours, and her breathing tube came out shortly after midnight. She is breathing on her own, just room air, although they might give her some oxygen for a little while today. 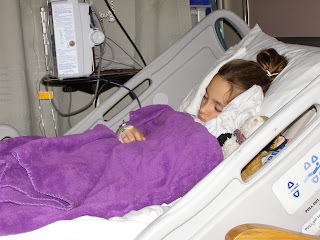 She is receiving pain medications, but when she is asked if she is hurting, she shakes her head no. The nurses say what a great patient she is, because she is so mild mannered. They ask if she is always this good, and of course we say yes! The doctors rounded this morning and were pleased with her progress. They plan to move her out to the general floor some time today. We could not ask for anything more, and we are awed and humbled by our awesome God and His provision for Chloe. We are grateful too for His people who have constantly been lifting Chloe up in prayer. Later today, we hope to read the comments and emails to her. 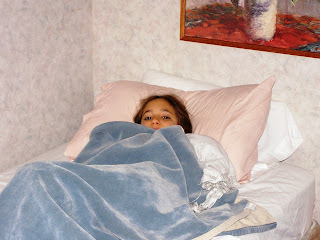 She is very drowsy and only whispering a few words to us, but she will be able to listen to all the encouraging words. 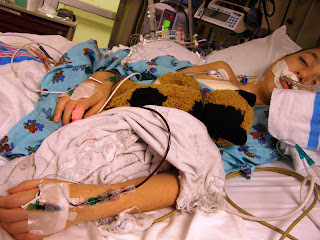 Chloe has had some awake moments this afternoon but is not yet able to have her breathing tube come out. She has developed a rash that they are giving her Benadryl for but are not concerned about. 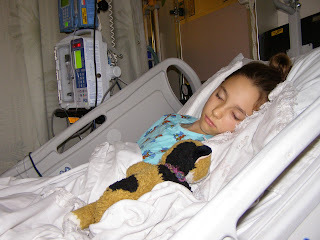 She has also been having some arrythmia that they will watch, but that is something they think is just a reaction to surgery and should go away. She does not seem to be in pain, so her pain medication is working! We would appreciate prayers for her breathing tube to successfully be removed, for her heart to beat in normal rhythm consistently, and for her to continue to have her pain controlled. UPDATE #4 4:12 p.m. We have been sitting with Chloe for over two hours now. She is not awake yet and is still on the breathing tube. Her color is good and she does not look swollen at all. Of course, she has many tubes coming from her all doing different things, but we know what these are doing for her. And to make it even better, Chloe's nurse in the ICU is Jeff's cousin. How comforting and reassuring that is! Her doctors are pleased with her numbers and are carefully monitoring her. They plan for the breathing tube to come out some time this evening, so that will be the next step in her recovery. We will continue to update on her progress, along with any specific prayer requests that come up. For now, we thank God this day has gone so well. We can't wait for Chloe to be able to read all the loving and supporting comments and emails! THANK YOU! UPDATE #3 11:53 a.m. God provided an amazing surgeon for Chloe. We just received an update from him about Chloe's surgery. He told us that her valve is quite deformed and at first he wasn't even sure he could repair it. After stitching for a while, he realized that wasn't going to work. After pondering it, he got an idea, something he hadn't tried before (he's been a surgeon for 30 years!). So he took his previous stitching out, re-did his repair, and was pleased with the results. Of course, the valve is not perfect, and we knew that, but it is good enough for now. It might, and most likely will, have problems later but for now, it is an answer to prayer. And we are so unbelievably grateful. We will update again after we get to see Chloe. Your prayers are helping us through! 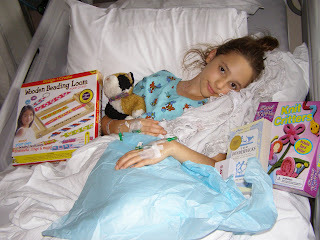 UPDATE #1 10:45 a.m.We received an update from someone on the nedical team caring for Chloe. She is on bypass, her chest is open and the surgeon is looking at her valve. We are a little concerned because we were under the impression that he felt confident he could repair the valve rather than replace it. Without going into too much detail right now, valve repair is a much better alternative to replacement. MUCH. But we were told there is some skepticism about being able to do a good repair. Please, please pray that a repair is possible. We know God is in control, we know Chloe is in God's hands. We know if the valve gets replaced, that is God's will. But we boldly ask that God will enable her valve to be repaired and that God will give us His perfect peace no matter what the outcome. It is 9:30 Tuesday morning. Chloe's dad and mom are sitting in the ICU waiting room. 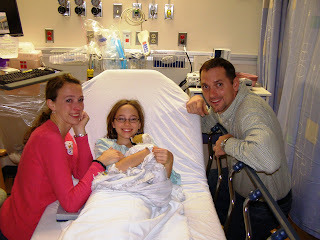 Two hours ago we watched a team of doctors and nurses wheel Chloe away for surgery. We have not received any updates yet, but we were told it would be a couple of hours before we heard anything. So we wait. We pray, we drink our coffee, we talk, laugh and cry. We are comforted by the prayers we know are being said for Chloe all morning, we are comforted by God's word, and we are comforted by the comments and emails left for Chloe. We even had the privilege to pray with a single mom whose son is having heart surgery today. She was here all by herself, sending her son off to surgery with no friends or family to walk her through this. We asked if she wanted to pray with us, so she sat with us and we prayed for Chloe and her son. We are so blessed by the love and support of friends and family and were happy to be able to share that with her. So far, no news is supposed to mean good news. We will update whenever we hear something. Another "God is here" moment - yesterday we were able to get a room at the Ronald McDonald house. It is 2 blocks away from the hospital. They do not take reservations because they never know when a child will be discharged and a family will leave. We called Monday morning and they still had no room. In the afternoon, we were speaking with the cardiology department social worker about lodging, and she said she would call and check again for us. A few minutes later she came out of her office and said, "Guess what! A room JUST opened up and I grabbed it for you." I (Chloe's mom) said to Chloe, "Wow! Isn't that amazing!" And Chloe said, "No, Mom. That's God." Indeed, it is! Chloe at the Rondald McDonald house early this morning. Good morning Sunshine! Just minutes before Chloe was wheeled away for surgery. Look at her sweet smile, even with mom crying by her side! What an amazingly brave girl. Chloe had a very long day today, but she is in good spirits. 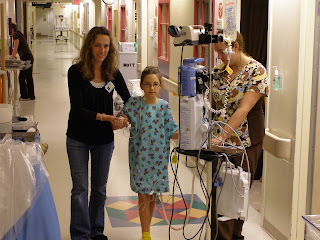 Actually, she is so brave and positive, she is pulling her mom through this without realizing it! 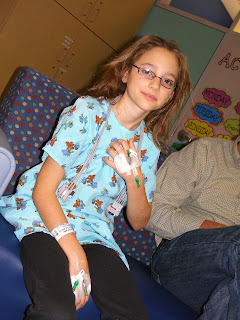 Chloe was at the hospital today for pre-op testing from 10 AM to 4 PM. She had her chest X-rays taken, Echo (ultrasound) and EKG done, blood drawn, toured the ICU and was examined by no less than three doctors. She got tired halfway through the day, but never complained once. 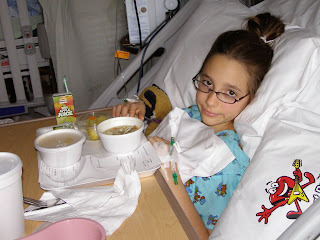 Probably the best part of the day for her was eating a delicious pasta lunch in the hospital cafeteria! Playing hangman with mom while waiting for her X-ray. 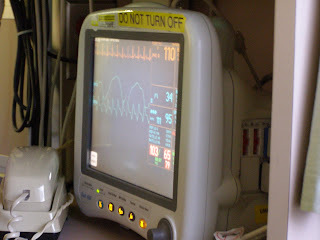 Watching a movie during her echo. Please pray for a good night's sleep tonight and for peace of mind in the morning. 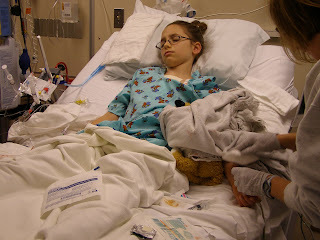 Pray for the surgeon's hands and minimal pain for Chloe. We will be at the hospital very early in the morning and will try to update several times throughout the day. Your prayers, comments and emails are so uplifting to all of us. Chloe continues to read each comment with a smile. 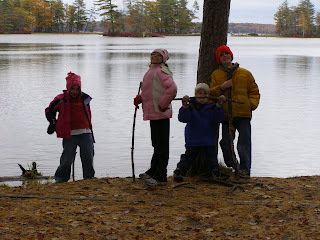 Since Chloe and her siblings didn't have school three days last week, we took a long weekend camping trip up north. Yes, it was cold. Yes, it was rainy. But we love camping, and it was worth the trip. Chloe's favorite part was playing games with her family (we played a lot of Qwirkle and Blokus during the rain!) 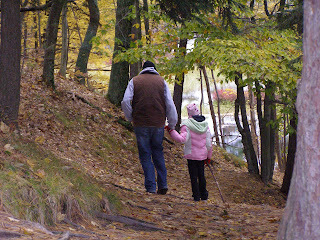 and taking a long hike around the lake. ion business. Bloodwork, x-ray, EKG, echo - she has had this all before and will tolerate it very patiently. But please be in prayer for a smooth day, for endurance and good spirits for both Chloe and her mom. Chloe says thank you to everyone for praying and caring and commenting. She has been having fun reading the comments and knowing there are a lot of people supporting her. Chloe wants you to know a little more about her, because while this blog is about her heart, there is so much more to her! Chloe is a huge BOOKWORM. She once read a 700 page book in 2 days. Chloe loves SPAGHETTI. She can eat almost as much as her dad. Chloe is NOT a morning person. She loves to sleep in. One thing Chloe does NOT like to eat is brussel sprouts. Chloe's favorite subject in school is science. Chloe likes playing games with her family. Her favorite game is Monopoly. Chloe's favorite song is "Mighty to Save. In the midst of all the national debate over health insurance, we were having our own insurance issues. The surgeon that Chloe's cardiologist wants to do her surgery is at a hospital not within our network. The surgeon's assistant told us our insurance company was difficult to work with, but they would do their best to get it approved. Some of you knew this and were praying that Chloe's surgery would be approved. 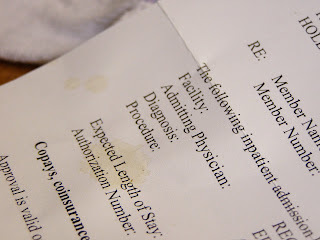 Ten days before the surgery date, we received a letter in the mail. Not only will Chloe be treated by one of the very top pediatric heart surgeons in the country, but insurance will do their part. If we ever doubt God's hand in all of this, we have a letter to prove otherwise. We changed the comments setting so you don't have to have a registered ID to comment. If you just click anonymous, then you can comment and leave your name in the comment, if you choose. Hopefully this makes it a little easier to comment. This blog is nine and a half years old. Well, not the blog itself, but the subject matter. 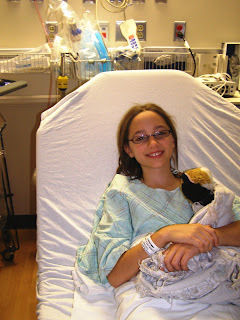 Our daughter Chloe was born over nine years ago, and six weeks after her birth we learned she had a congenital heart defect. 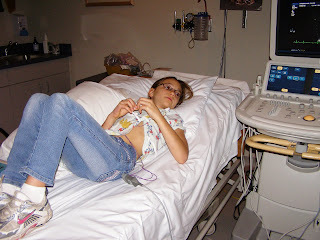 We have since learned that having a child with CHD (congenital heart defect) is a road trip we did not ask to take, one without a map and always on the verge of running out of gas, but it is also one we navigate willingly. Because this is our daughter, and we love her when the road is bumpy and when it is smooth. Our daughter is beautiful, yes - big brown eyes and an enchanting grin. But is her heart? 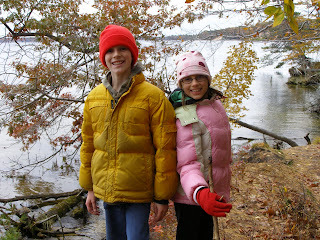 The name of this blog comes from chapter 5 of the book Walk on Water by Michael Ruhlman. It is a must-read for those touched by CHD, and an excellent book in general. This chapter ends with a mother standing in a hospital corridor, having just handed her baby over for open heart surgery. She is sobbing into her hands. Those of you who have been in that corridor - you know. We all hope for a beautiful heart. Not perfect, but functioning. That is beauty for us. Her defect is called partial atrioventricular canal. It is also known as an endocardial cushion defect. In other words, her heart had 2 holes in it - one between the two atria and one between the 2 ventricles. 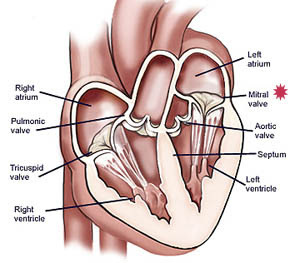 Her mitral valve leaked due to a cleft. 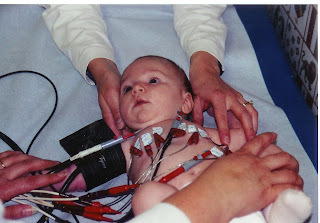 When she was 18 months, the VSD (ventricular septal defect, or hole between the ventricles) closed on its own. When she was three and a half, she had open heart surgery to repair the ASD (atrial septal defect) and the mitral valve. We were told after this surgery that her mitral valve was atypical in the way it was deformed and as a result very difficult to repair. It would leak again, we were warned. One year after her surgery, her cardiologist said she would need another surgery, but he would try to buy her as much time as possible. 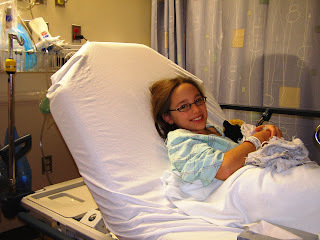 Now it is time, and her second surgery is rapidly approaching. It is both hazily surreal and painfully certain. 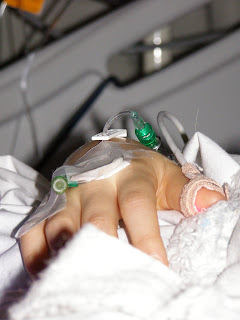 On October 27, 2009 she will yield to the surgeon's hands again. There are so many emotions factoring into this. But above all, we have hope, and that will be enough. Thank you for caring about Chloe enough to follow her story. We will post more about her, her heart, and her upcoming surgery. We will also list prayer requests, answers to prayer, and glimpses into our CHD road.